The two swords overlap at the tips with rose vines growing around them. 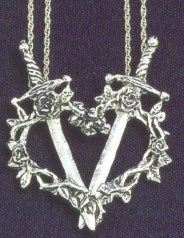 This design can be strung on one chain (the vine hooks together), or it can separate for two people to each wear one-half. When separated, each sword hangs straight down with the rose vine arching around it very dramatically.